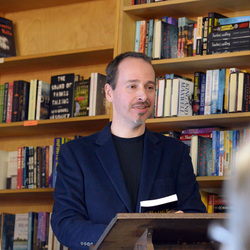 Art Edwards's novel Badge (2014) was named a finalist in the Pacific Northwest Writers Association's Literary Contest for 2011. He also released a solo CD, Songs from Memory, in 2008. His shorter work has appeared in The Writer and Salon, among many others. He lives in Portland, Oregon with his wife Raquel.